Cyclone Enawo made its landfall and weakened as it advanced inland. Tropical cyclone Enawo slammed into Madagascar on Tuesday, killing three people and displacing hundreds as it buffeted the island with hurricane-force winds and pounding rain. The national disaster management agency BNGRC, in a preliminary toll, said 468 people had been displaced in the northeastern district of Maroantsetra, and a landslip there had killed three people, including two children, injured six and damaged four schools. Videos on social media showed flattened trees, flooded roads and corrugated sheeting that had been ripped from roofs. 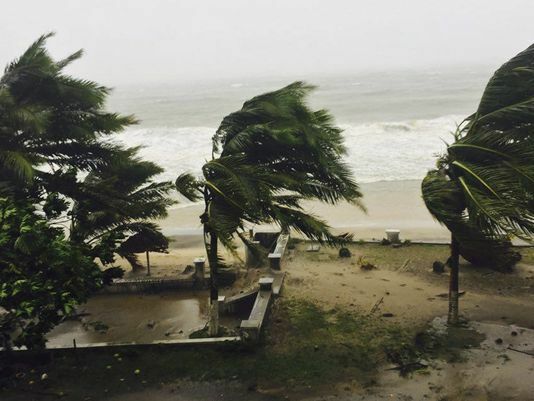 Enawo made landfall in the northeast of the country in the Antalaha area with winds gusting up to 290 kilometres (180 miles) per hour, the country’s weather service said. The cyclone weakened as it advanced inland at five kph, but at nightfall was still blowing at 165 kph, with peak gusts of 200 kph. The entire north of the island nation, which lies 400 kilometres (250 miles) east of mainland Africa, is on “red alert”, Samueline Rahariveloarimiza, the head of the weather service, told AFP. Up to 700,000 people could be affected by the cyclone, according to the Red Cross, which has deployed 500 volunteers. Strong winds and heavy rain have been battering Antalaha and Cape Masoala in the country’s northeast since Monday. The cyclone is expected to leave Madagascar on Thursday, but there are fears it will leave widespread flooding and deadly landslides in its wake. Residents in Enawo’s path had been advised to evacuate low-lying areas, seek shelter and stock up on food and water. Madagascar’s storm season normally runs from November through February and claims dozens of lives every year. In 2012, tropical storm Irina and tropical cyclone Giovanna claimed more than 100 lives. The Indian Ocean island has suffered severe drought and food shortages since 2015, with the southern region the worst affected.